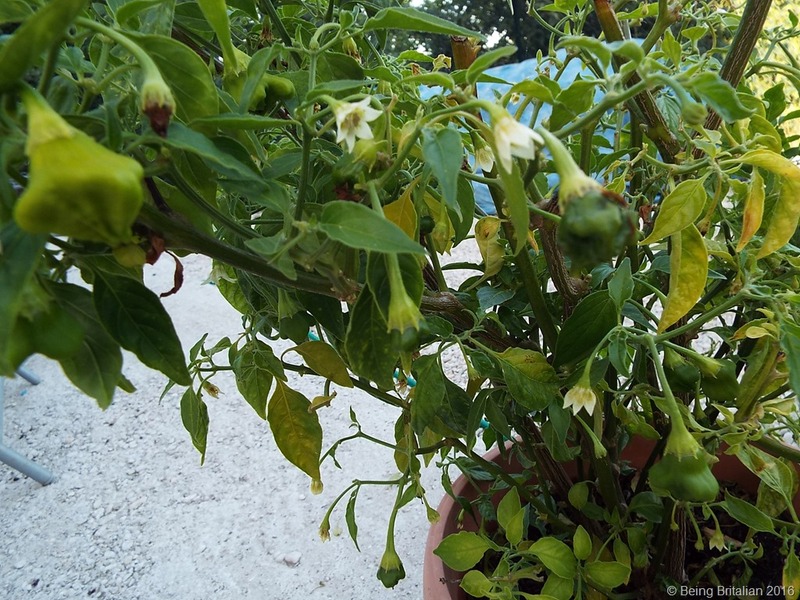 Each year I grow hot Italian chillies and as I harvest them I sun-dry them in batches for use throughout the year. Once dried they store in an airtight jar for a year or so. Just make sure when you pick some out that your fingers are dry, a tiny drop of water in the jar will spoil them. As my chillies in the orto are almost ready to harvest I decide to use up some of last years to make way for the new crop. I’ve also been growing some Jamaican Scotch Bonnets, the plant is in its second year and after a not so good season last year, I took advice and potted it up to restrict the roots and it’s bearing lots of bright orange fruits this year. 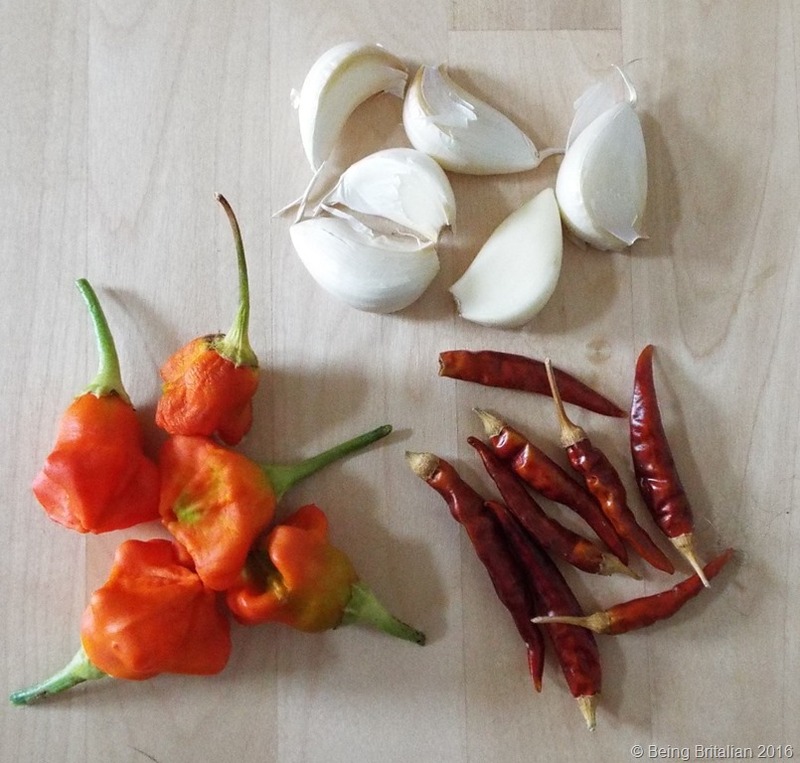 So using these two varieties I thought I’d create a Caribbean-Italian fusion hot pepper sauce. 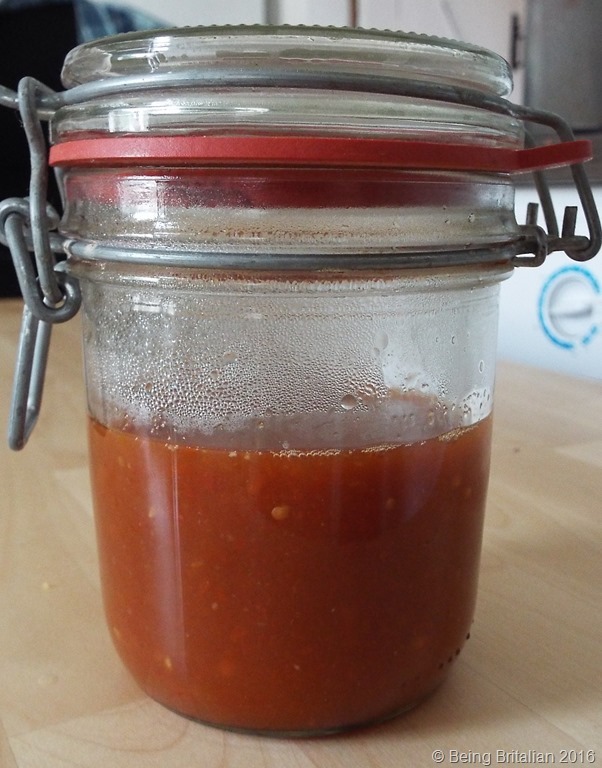 8 sundried cayenne chillies, 5 fresh Scotch bonnets, 5 garlic cloves, 230 ml white vinegar, 2 teaspoons malt vinegar, 1 tsp salt, 1 tsp sugar, 2 tsp red wine and a tsp of tomato puree. 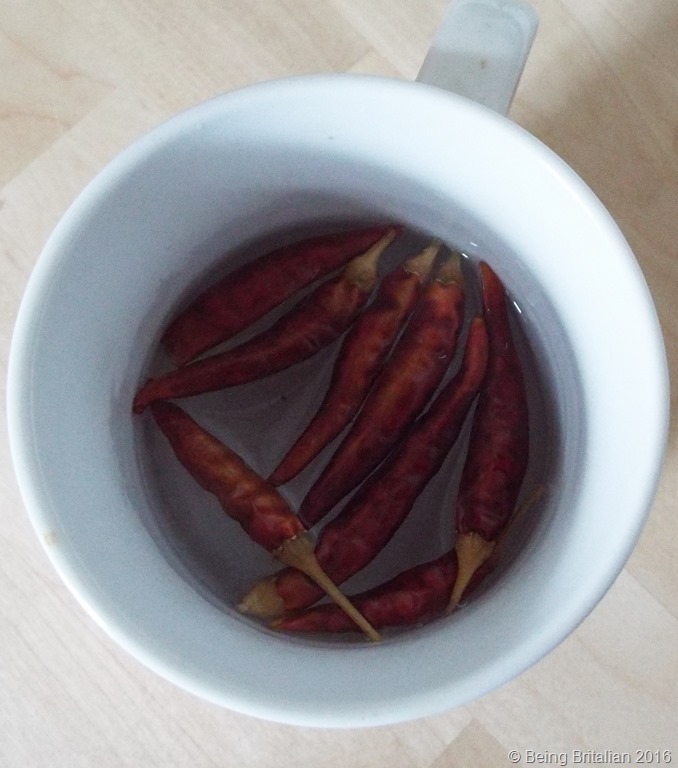 First boil a kettle and soak the dried chillies to rehydrate them. While they’re soaking trim the stalks off the Scotch bonnets and peel the garlic. 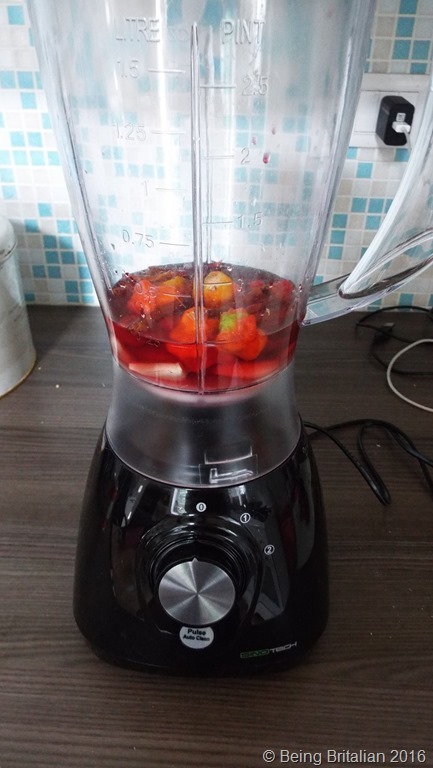 Once the chillies are rehydrated take their stalks off and add everything into a blender and blitz until smooth. NB: The tomato puree is used purely to add colour to the sauce as the orange Scotch Bonnets have very little colour. 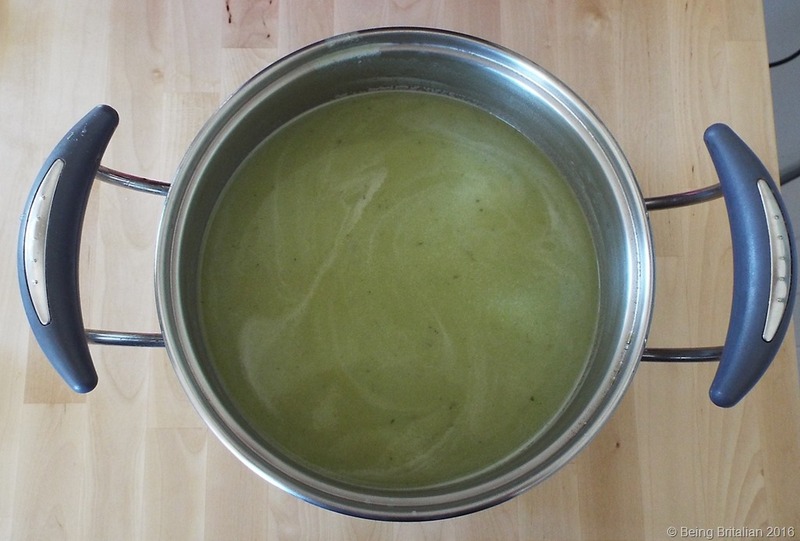 Transfer to a pan and simmer the liquid until reduced by a third. OPEN A WINDOW and don’t stand over the steam and breathe it in as it’ll cause you to cough and can irritate the eyes. 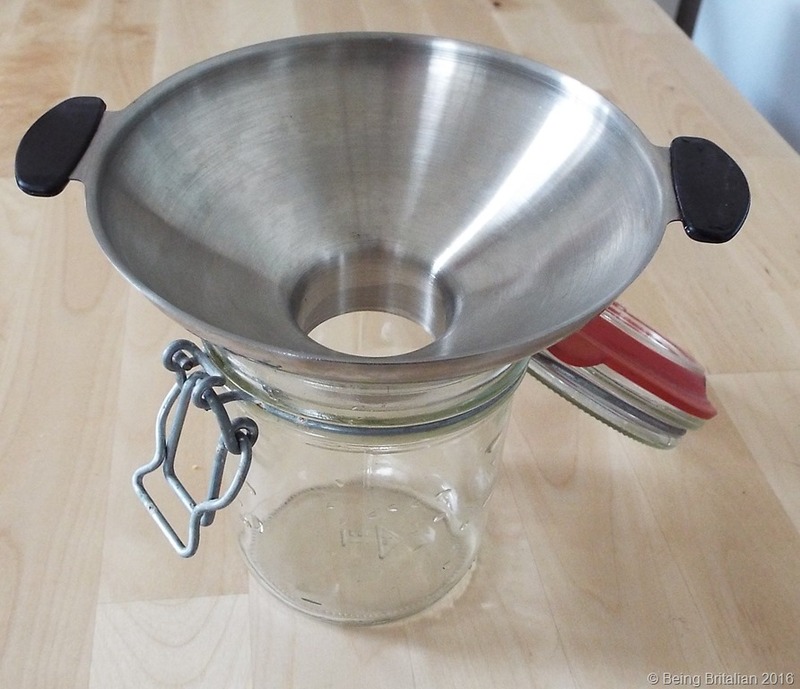 Remove from the heat and using a jam funnel decant it hot into a sterilised jar and seal. The consistency of this sauce should be loose, very similar to Tabasco rather than a gloopy sauce. If you don’t want seeds in the sauce then it’s okay to sieve it. Like similar sauces the salt and the vinegar are excellent preserving agents so should keep in a dark cupboard for around 3 months and in a refrigerator for 6 months. So how was the taste test? 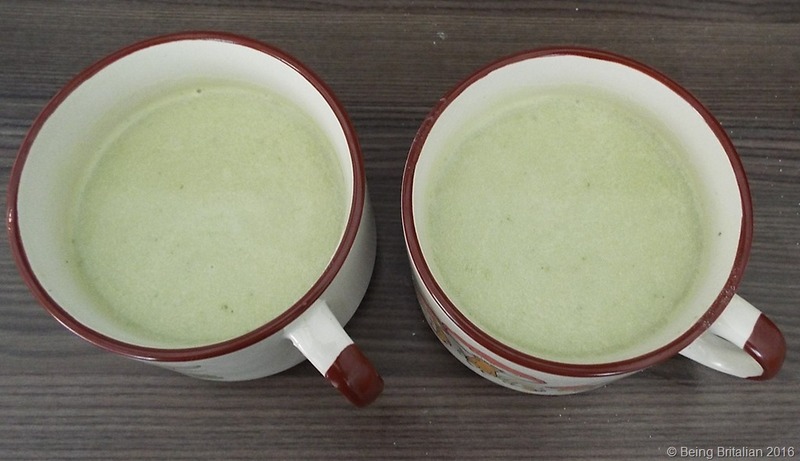 It was hot but the sugar took away the harshness. 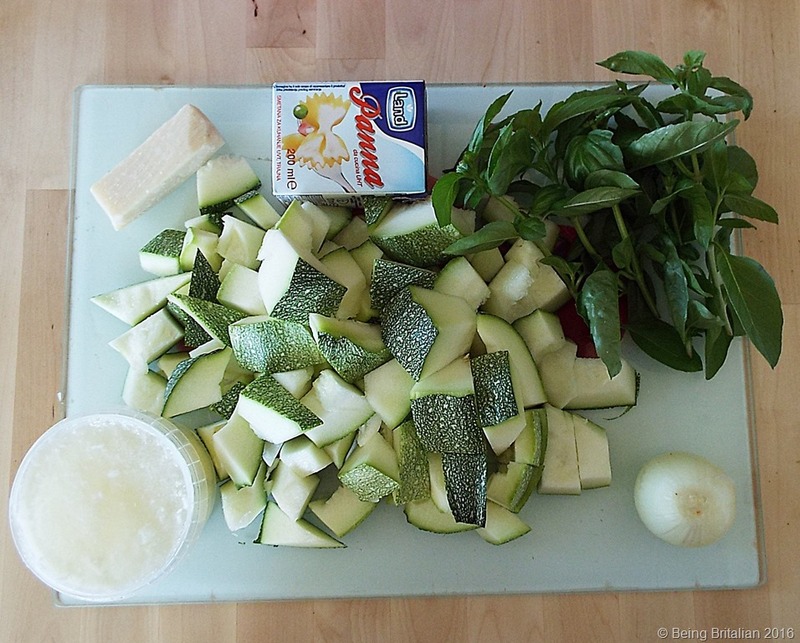 I think it’s ideal for adding into stews, soups and sauces and good for drizzling over pasta dishes. I may even try a little on a pizza turning Margherita in la Diavoletta. 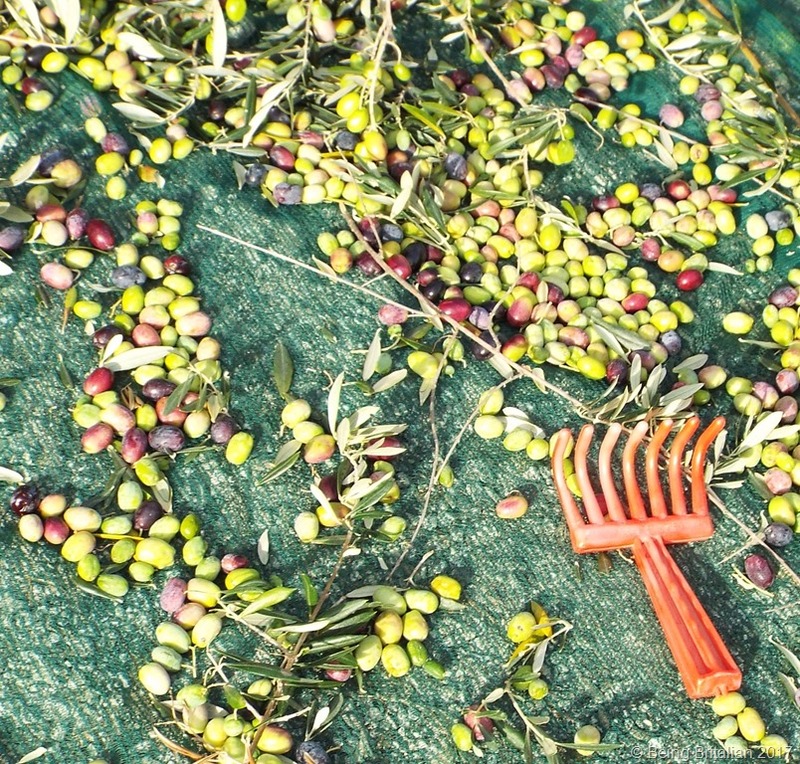 Last year at this time of the year we were suffering a heat wave, so much so that the orto struggled. My tomatoes were burnt off by blazing sun, the cucumber ran to seed and everything suffered apart from the pumpkins. This year is a much different story, the weather has been kinder, we’ve had oodles of early summer rain and things are flourishing. I’ve already picked several courgettes and cucumbers and my tomatoes are putting on some good growth, so there’ll be plenty of passata made this year. Confidence in the harvest can be seen everywhere. Piero at our local restaurant has a sign up advertising his tomatoes for sale; Well he does have over 3,000 plants. 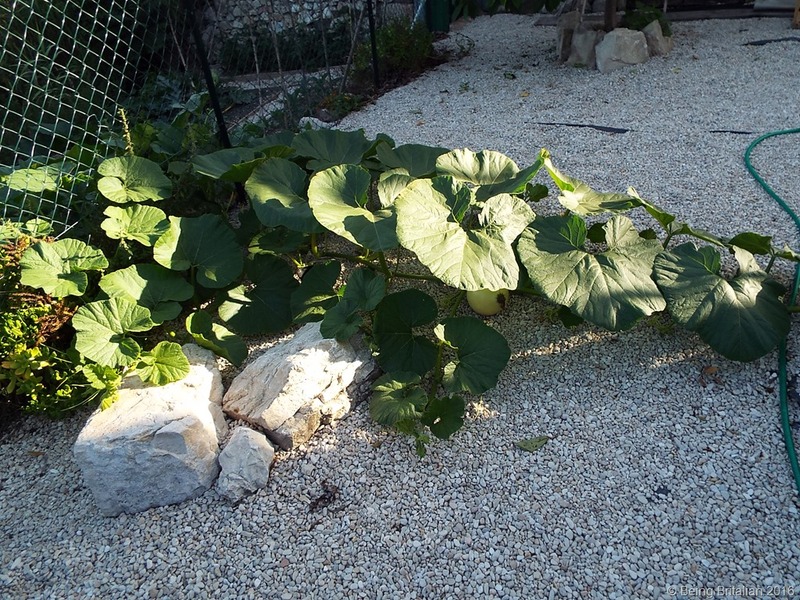 Once again my pumpkins have got off to a good start with them taking over the orto like something from a 1950’s B movie, they’ve swamped the butternut squash, but I think that’ll do it some good as it doesn’t like it too hot. I’m pleased that I took advice to dig up my Scotch Bonnets and put them in a pot. They’ve over wintered really well and now have lots of small fiery chillies coming. 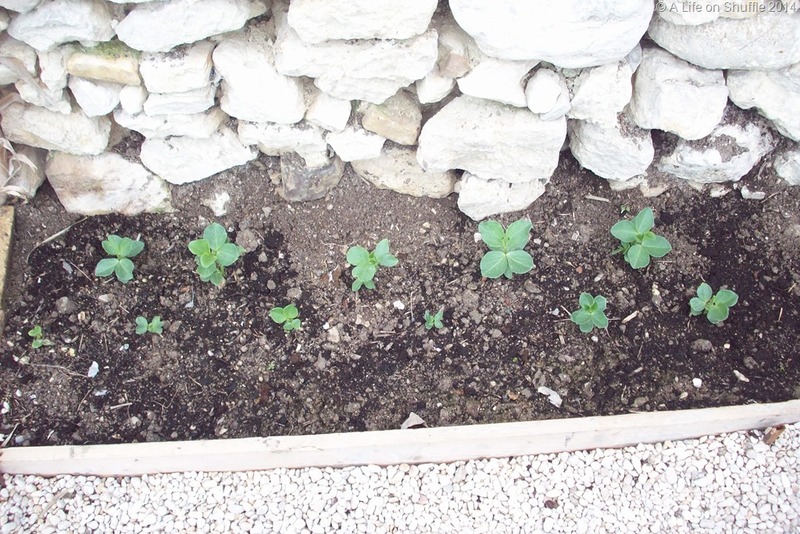 The French beans are doing their thing in a small bed and I’ve a handful of cabbages growing merrily away. 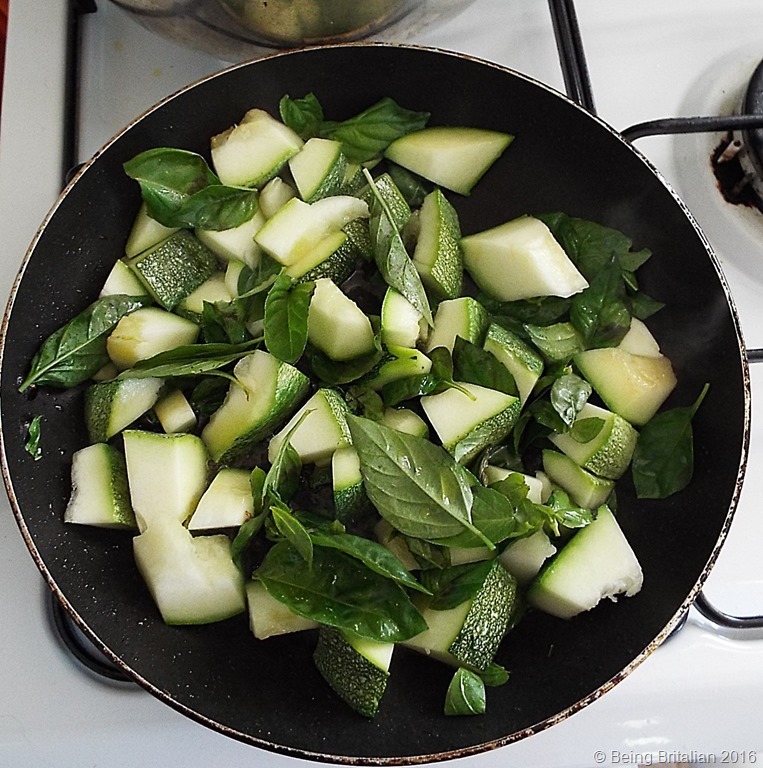 The thing I’ve been really pleased with is the Italian basil. Over the past few years I’ve tried all sorts of basil and it either takes forever to germinate and grows into spindly little plants or just sits beneath the surface refusing to pop up. 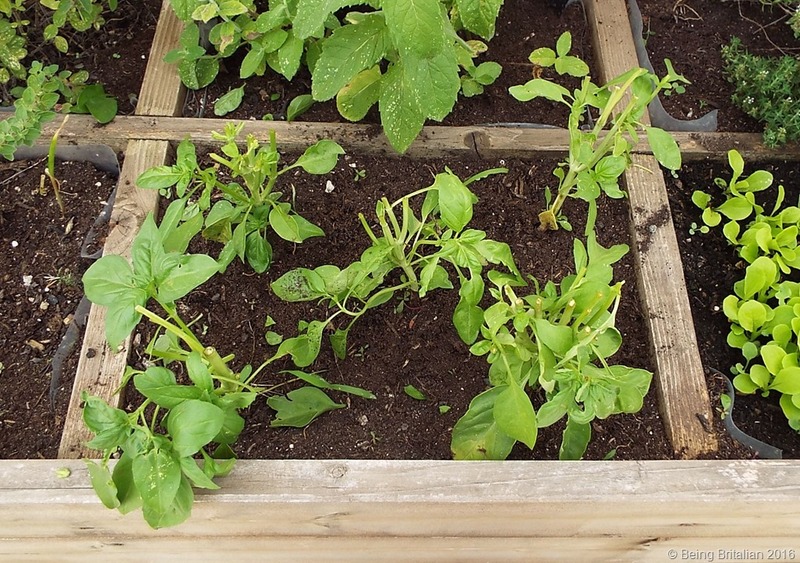 I had purple basil a couple of years ago and it was disappointing, as was many other varieties. 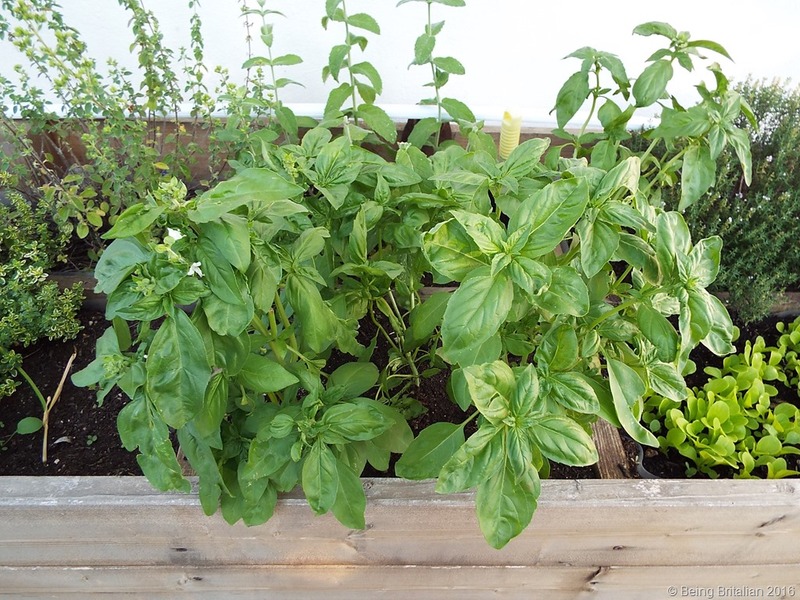 But this year I bought a packet of Italian basil seeds and hey presto they were poking out of the soil in days and so far I’ve already cropped 4 bags full and am storing it in the freezer. I’ll be cropping again today, cutting it back quite harshly, but there’s no need to worry as it’ll send out side shoots and very soon there’ll be more basil for caprese salads and chopping up and adding to passata. Because of the risk of botulism I don’t make infused basil oil and store it in the cupboard, what I do is make it fresh, by heating basil leaves in oil and then letting it go cold and using it that day. 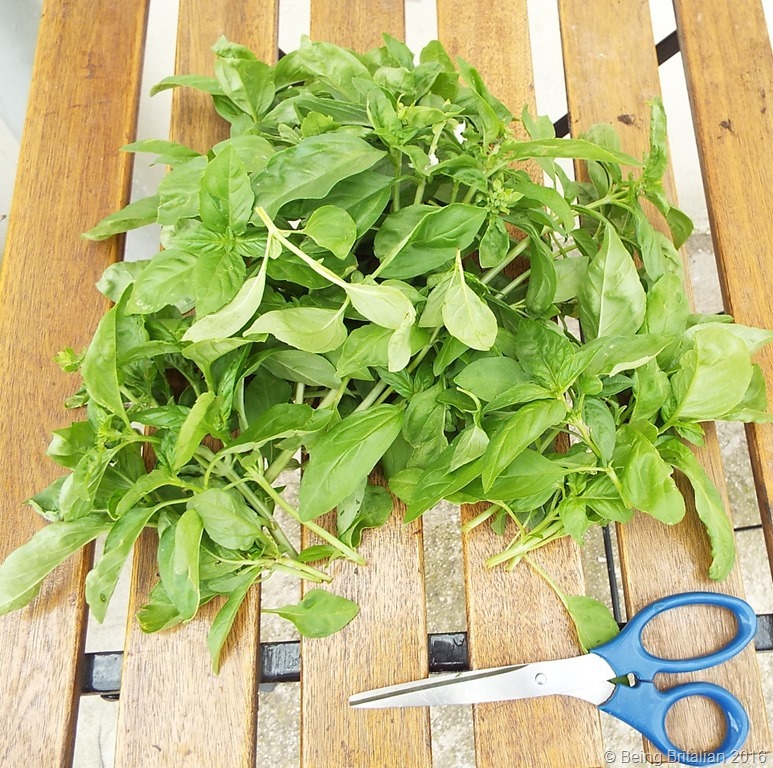 Freezing is a good way to store basil, chop and wash then pat dry and freeze in a plastic bag, a day or so later crush the contents in the bag and you have flaked basil ready to add frozen to sauces later in the year. Maybe I’ll have a go at turning the next cropping into basil jelly. As a extra note having had 2 messages from non UK people thinking I’d spelt ‘Faulty’ incorrect. Fawlty was a UK named hotel owner in a British TV comedy series played by John Cleese. 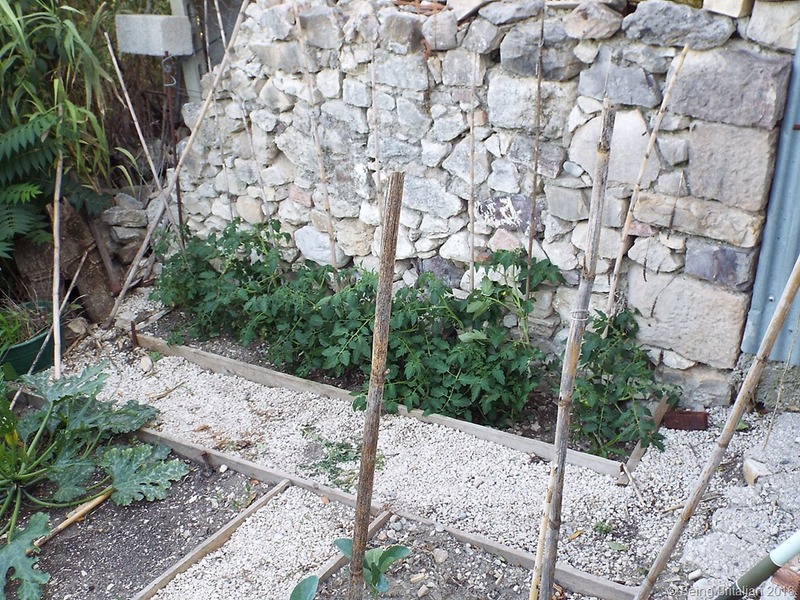 Monday: I’ve been working on getting my orto (vegetable garden) sorted out, following the lands many years as a wilderness. With the eventual sorting out by, Seppe of the carnage that the previous builder and his digger driving friend Toto left behind I now have a fenced off little patch to grow my veggies in. It’s about an fifth of the size of my old allotment back in the UK, but as I wont need to have greenhouses in Italy, I’m sure I can cope with less space. That said I will have a much longer growing season, and also have to adapt to what will and will not grow over here. I have a small portion of wall dividing my orto from the land owned by my neighbour, so my first job has been to set up a walled-bed and a path, in this bed I shall start they year off with my broad (fava) beans and they’re already getting off to a good start; three sowings have taken place, five weeks apart for, hopefully a nice amount of beans during the harvesting season. 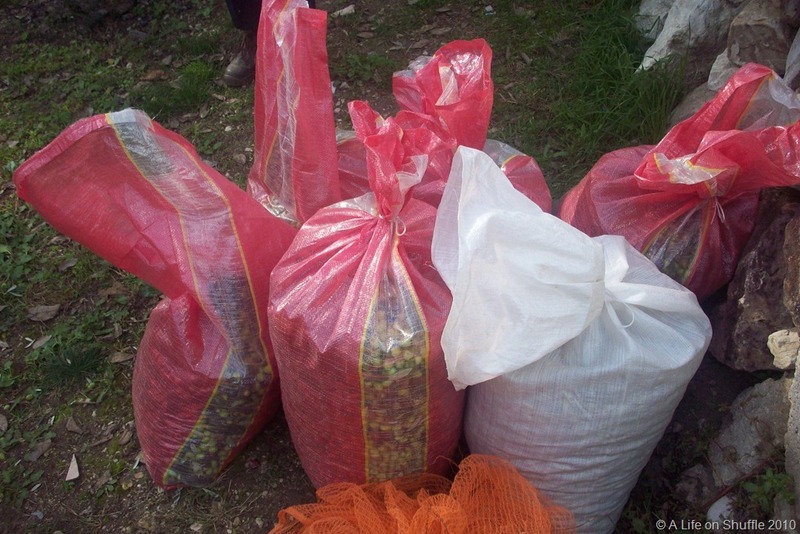 Also beans add a good deal of nitrogen to the soil so they’ll be helping to condition the earth for the following year. 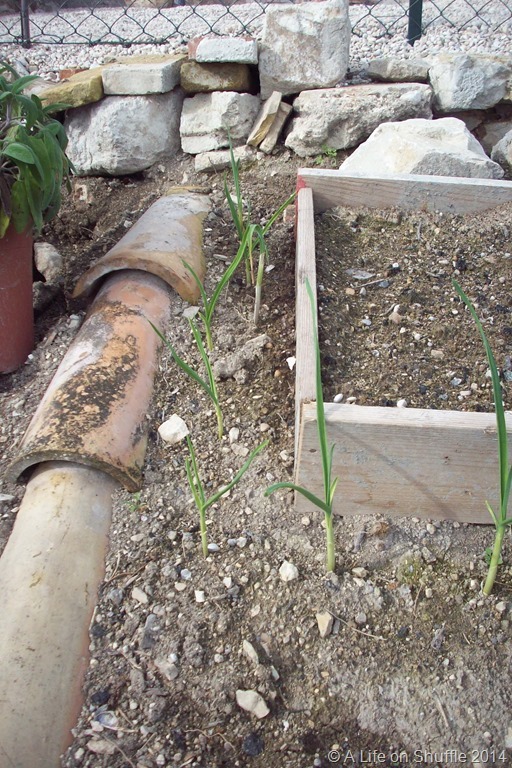 I planted a dozen garlic around the raised salad bed I built a few weeks ago and they’ve now pushed through and are growing well, taking advantage of the early sun we’ve been having. My orto is south-west facing and after the sunrise gets the early morning sunshine and as that golden orb moves across the sky it gets the heat in the afternoon but none of the direct sunlight, which will be ideal for water conservation and tomatoes and chillies that can split in direct sunlight. Tuesday: I had meant to go and cut some canes from the bamboo that’s growing down from the orto today, but I think mother nature is having ‘that, time of the month. The month being February. The wind is whipping the bamboo and the dry canes sound like witchdoctors rattling bones as they curse the elements. February is a windy month here, some say its the sirocco; which I know they get across the Po plains up north. I’m not sure we get it so far down here, but as I don’t know I couldn’t say for sure. What I can say is they’re jolly blustery and I fear for the roof tiles. I’ve just spent an half hour collecting plant pots, dog toys and various other items that have been picked up by the wind and deposited elsewhere. Wednesday: Today the wind has dropped, so as Time Bomb by Jamie Tracy plays on the iPod, I start to build a fire on the land at the side of the house. I love a good fire, as my friends on Facebook can verify as there’s always a photo of me with some bonfire throughout the year. 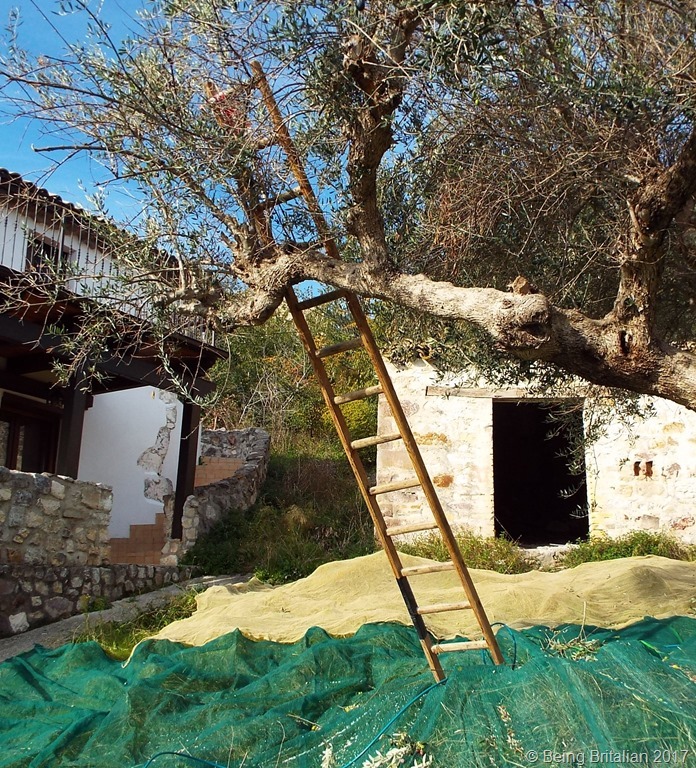 My neighbour Domenico has pruned the two olive trees he owns next to my house and has stacked the trimmings neatly. I asked if he wanted them and he said no, so I thought I’d tidy up and burn them. Now I have never burned olive before, but as others around are burning their pruned branches I know the green wood burns… Oh boy does it burn, it goes up like someone has thrown petrol onto the flames. What is normally a gentle campfire becomes an inferno with the addition of olive wood. The smoke is noxious. black, choking stuff which surprises me, you’d expect it to smell nice like pine does when it burns. I guess the tree’s natural oils must be like throwing cooking oil onto a fire. O.H. hands me a glass of fizz and the iPod shuffles and Toni Basil starts to sing, Time After Time as the latest addition of wood crackles, and sparks dance like malevolent imps in the evening air. We’ve just had our October festa here in Casoli and an enjoyable three days it was too. 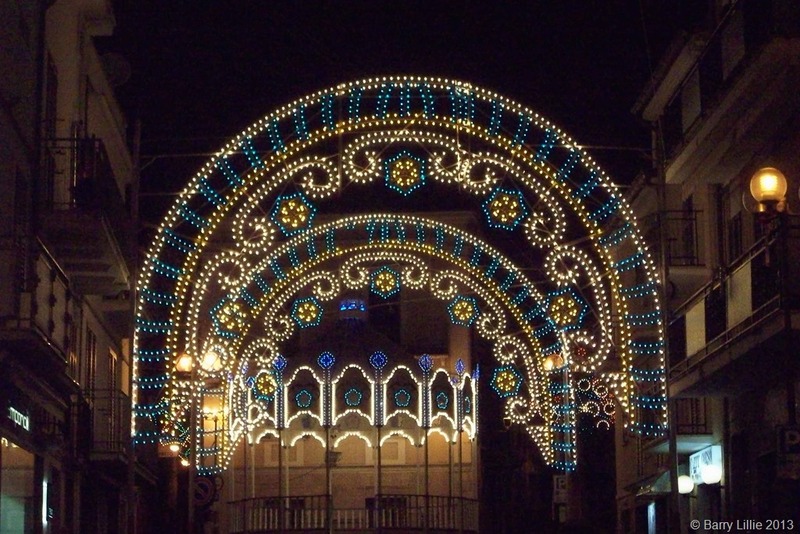 On the first evening we enjoyed a stroll around town taking in the lights that festooned the streets before settling down for a few drinks at the borgo. There was a music system set up in the corner and a young man sang a mix traditional and modern songs and the piazza outside the post office became an open-air dance floor, as previously mentioned in https://intheflatfieldidogetbored.wordpress.com/2013/10/15/dancing-in-the-street/. 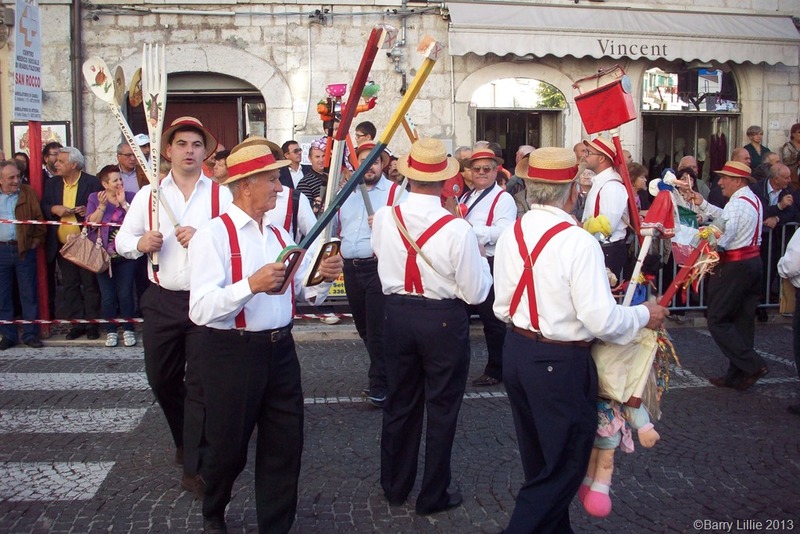 The second day is Giornata dei Donativi, (day of donations) the traditional parade to celebrate the Feasts of S.Reparata and S.Gilberto. 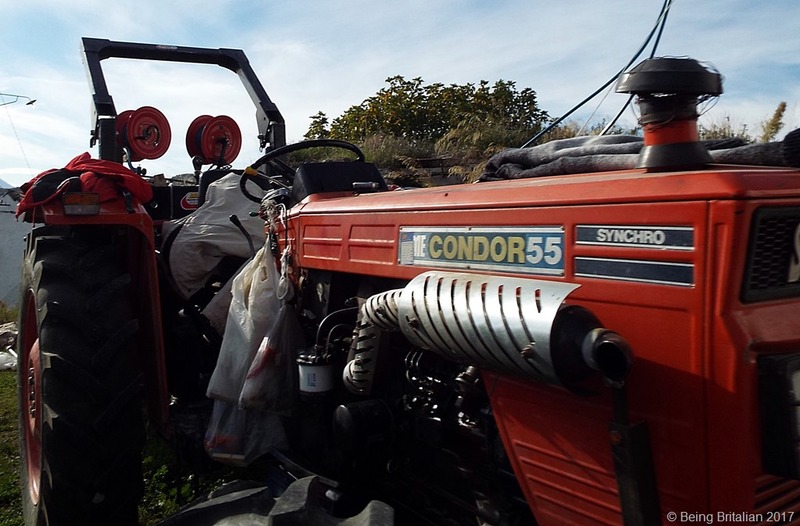 Tractors have been cleaned and flat-back lorries are bedecked with decorations and to give thanks for the harvest, people attired in traditional dress march through the streets handing out samples of oil, porchetta, mortadella and wine. Music plays and small children squeal with delight as the whole town lines the main street to watch. The evening is taken up with a rock band playing in the piazza while fairground rides entertain the teenagers. The third evening again has musical entertainment as a singer/impressionist entertains the crowds as he takes off popular Italian singers, as he changes costumes various other artistes entertain before we slope off to the borgo again, I toast the end of the festa with a grappa before making the steep climb up to Christine and Bill’s house on Via Gianino, for chicken curry and to watch the end of festa fireworks from their fabulous roof terrace.